Izzie’s is offering Matte Love Lipstick appliers for Catwa, Genus, LeLutka and LAQ Omega mesh heads at the current TLC “Vintage Spring Market” round. Each set includes 18 colors in 2 shades. BakesOnMesh system tattoo layers are included as well. 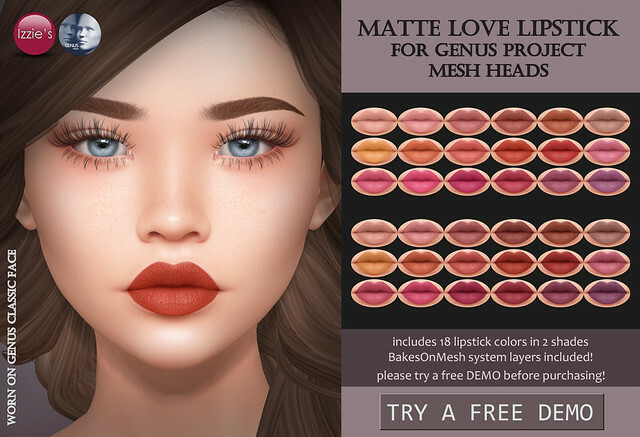 Please try free demos before purchasing, you can try them at TLC and also at Izzie’s mainstore. There is a Candy Cane Lipstick Christmas Gift available at Izzie’s! 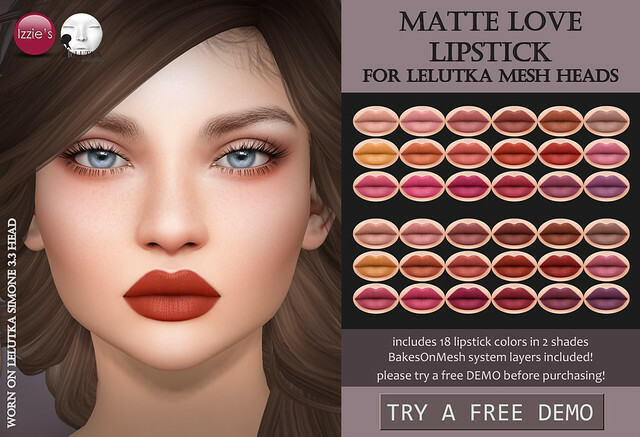 The set includes appliers for Catwa, LeLutka and LAQ/Omega. BakesOnMesh system tattoo layers are included as well. You’ll find the lipstick under the christmas tree at the entrance of Izzie’s mainstore and also on Marketplace.